Natural burial cemetery of 2000 m2 at Südfriedhof in Magdeburg, Saxony-Anhalt in Germany. 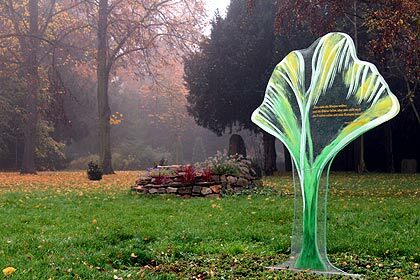 A glass sculpture of a stylized Ginkgo leaf marks the location. „Man sieht die Blumen welken und die Blätter fallen, aber man sieht auch Früchte reifen und neue Knospen keimen". Several Ginkgo trees have been planted on this cemetery. Famous poem about the Ginkgo by Goethe on my website. Photo and more on this website.